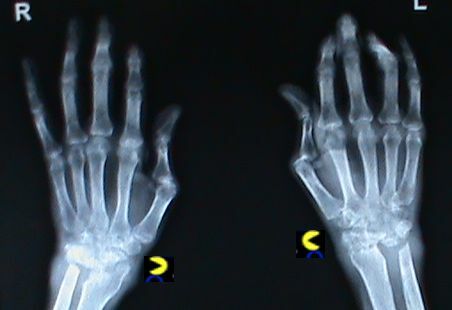 RA-the Pacman- How does RA cause deformities? I’m sure all of you know that Rheumatoid arthritis (RA) is an autoimmune disease, which means that the body’s immunity considers its own joints as foreign & attacks them. We have not been able to pinpoint the exact reason for this. If this immune attack is not controlled in time, it ends up destroying the joints. So what starts as joint pain & swelling can well end up as deformities & disabilities. But then, how does RA cause these deformities? The joint is lined by a thin membrane called the synovial membrane from the inside. The immune attack is targeted towards the synovial membrane. The synovial membrane swells up due to the attack & is called ‘the pannus’. This pannus is like the pacman. Remember the pacman game… pacman eats away all the dots. In a similar fashion, the pannus eats the cartilage & the bones around it. When it eats the bones, the same is known as erosion. 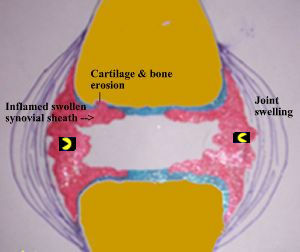 The RA pacman can go even further & damage the tendons outside the joints. Once the tendons are affected, joints get deformed. The Pacman game.. Pacman keeps eating the dots…just like the RA pannus keeps eating the cartilage & the bones. Note how the RA Pacman has destroyed the carpal bones in the wrist. 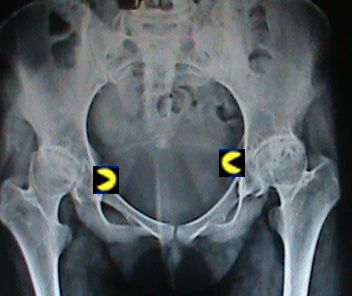 Note how the hip bone & the cartilage in the joints has been eaten up by the RA Pacman. Yes, very much so. Seeing a Rheumatologist at the earliest & starting DMARDs (Disease modifying anti-rheumatic drugs) at the earliest can definitely tame this pacman & prevent deformities. This entry was posted on Sunday, August 1st, 2010 at 7:55 am and is filed under Uncategorized. You can follow any responses to this entry through the RSS 2.0 feed. You can leave a response, or trackback from your own site. 18 Responses to RA-the Pacman- How does RA cause deformities? when joints are inflamed,is that mean that damage is occuring in the joints? the noise that joints make also a cause of deformities? hope u clear these doubts of abt 80% of the patients.. Yes Rachel, inflammed joints are being destroyed at same time. The RA pacman is slowly chewing the cartilage & the bones from within. Hence, the best way to prevent deformities is to control the RA inflammation asap. Once the cartilage is damaged, the two bones tend to rub against each other during movement. This is the cause of the crackling sound a joint makes. This is most obvious in the knee & the hip & leads to severe pain. The same is known as secondary osteoathritis. Very early deformities are correctable as active joint inflammation plays an important role in their causation. However, later on, the deformities that characterize chronic RA are not amenable to medicines alone. Surgery remains the only option in such cases. What is DMARD? How the drugs work? What does it mean by desease modification? That’s a very important question indeed… in fact, I should have posted a blogpost on this basic question much earlier. I’ll post the post asap. Log onto http://www.arthritissupportboard.com/biologics_for_RA.aspx for answer to your question. I’ll put a detail blogpost soon. Amazing comparison of RA with Pac Man game..I am sure any RAers will be positive and go for treatment!!!! RA-The PACman – Yup! my joints are slowly being eaten up. The rate changes, but the process goes on. Have not found total help from MTX and hydroxychloroquinone, but the rate is greatly slowed. I think hip replacements are on the table, along with knee replacements. Just trying to decide which one(s) to do first. Even if we add a Biologic now, and it worked, I’d still need the joint replacements, at this point. You have put forth a nice point, Elizabeth. Joint inflammation is like fire & joint damage is like the resultant ash. You can put water (DMARDs & biologics) to put out the fire. However, the same will not work for the joint damage. Joint replacement surgery remains one of the best options to take care of severely damaged joints. I have seropositive RA. No one has EVER told me or mentioned that I have ANY pannus. No radiologist has ever mentioned it on my hand or wrist xray reports. I don’t think I have pannus. Cystic changes in the wrists and erosions, yes. No mention ever of pannus. Yet I do have VERY deformed wrists. I have always assumed it was just that whatever inflammation that was in there just ‘stretched out’ my ligaments and tendons and therefore allowed all my wrist bones and hence the ends of my arm bones to slowly slide out of place. Do you have cases of severe deformity without any/or much pannus? 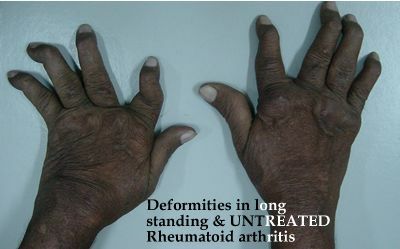 Rheumatoid arthritis (seronegative or positive)is characterized by pannus. It is seen on MRI/ Ultrasound & not on the Xray. X ray would only show the bones & deformities/ erosions. All these are the results of pannus. Thanks! Thought about that after i posted. The erosions that you see on x ray irepresents the joint damage due to Pannus. Hi there it’s me, I am also visiting this website on a regular basis, this web site is really nice and the viewers are really sharing fastidious thoughts. Excellent post. I was checking continuously this blog and I’m impressed! Very helpful info specifically the last part 🙂 I care for such information a lot. I was looking for this certain info for a long time. Thank you and good luck. of the comparison of most up-to-date and previous technologies, it’s awesome article. Simply want to say your article is as surprising. The clearness for your post is just cool and that i can suppose you’re knowledgeable on this subject. Fine with your permission allow me to take hold of your RSS feed to stay updated with drawing close post. Thank you one million and please continue the rewarding work.